80 years of complimentary experience in engineering technology and industrial production in electrochemistry have come together in a collaboration and partnership to address energy supply for the future. In a collaborative partnership starting in 2013, NORAM Engineering and Constructors Ltd (Vancouver, Canada) and Permascand AB (Ljungaverk, Sweden) have jointly developed the NORSCAND™ electrolyser, a novel multi-compartment electrolysis cell specifically designed for salt splitting of brines. One application of the cell makes it possible to extract lithium hydroxide through electrochemistry instead of the traditional method of a metathesis reaction between lithium carbonate and calcium hydroxide. “The NORSCAND™ family of electrolysers evolved from an industry requirement for a scalable electrochemical platform. Permascand brought its extensive experience in the industrialization and large-scale manufacture of electrochemical products contributing to the novel process and scale-up designs proposed by NORAM,” explains Erik Zimmerman, Product Manager at Permascand. Discover Nemaska Lithium through the eyes of the team, from the Whabouchi mine site to the Shawinigan transformation plant. The scalable production of lithium is crucial when the world needs to switch from fossil fuels to electricity, given the central role played by lithium hydroxide in the manufacturing of batteries for electric vehicles, mobile phones, and computers. One example is car manufacturer Tesla, which relies entirely on lithium batteries for all their vehicles. One of the customers of NORSCAND™ is Nemaska Lithium Inc. in Quebec, Canada, which will inaugurate the world’s first industrial-scale NORSCAND™ electrolyser for the production of high-grade lithium hydroxide at its Shawinigan, Quebec, electrochemical facility. Nemaska’s Phase One Plant which will initially produce 610 tonnes of lithium hydroxide and lithium carbonate annually, is slated for expansion to a full-scale commercial facility. 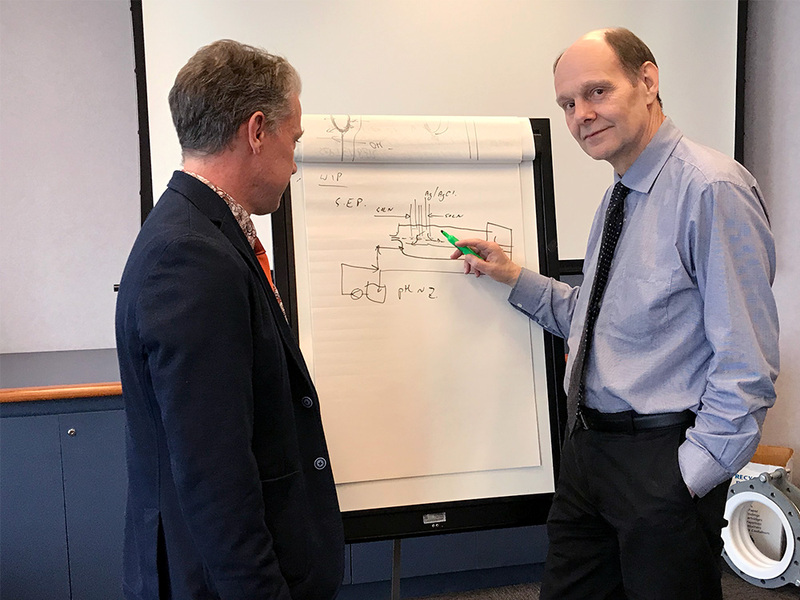 Erik Zimmerman (to the left), Product manager at Permascand in deep technical discussions with Clive Brereton, Vice President Technology at NORAM. 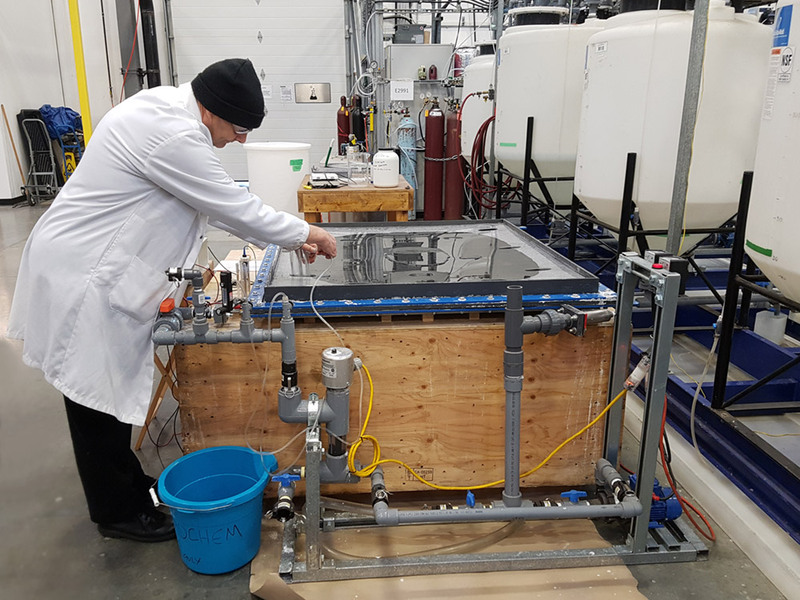 Clive Brereton in the laboratory in Vancouver, Canada, investigating and anticipating anode coating life time on the NORSCAND™ cell.